A NASA glaciologist has discovered a possible second impact crater buried under more than a mile of ice in northwest Greenland. This follows the finding, announced in November 2018, of a 19-mile-wide crater beneath Hiawatha Glacier – the first meteorite impact crater ever discovered under Earth’s ice sheets. 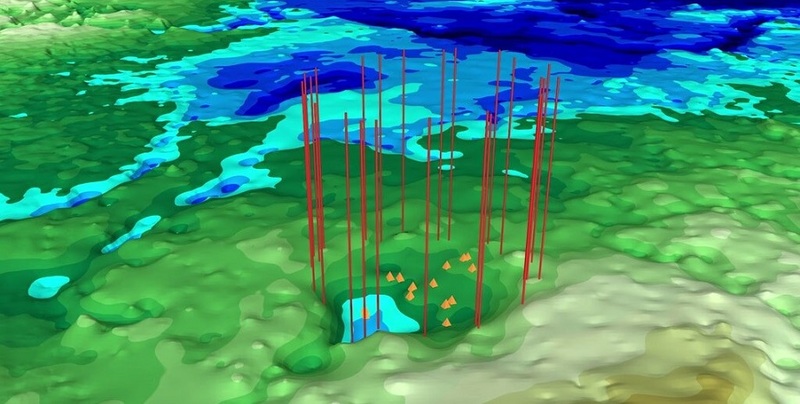 Though the newly found impact sites in northwest Greenland are only 114 miles apart, at present they do not appear to have formed at the same time. "I began asking myself ‘Is this another impact crater? Do the underlying data support that idea?’," MacGregor said. "Helping identify one large impact crater beneath the ice was already very exciting, but now it looked like there could be two of them." "The only other circular structure that might approach this size would be a collapsed volcanic caldera," MacGregor said. "But the areas of known volcanic activity in Greenland are several hundred miles away. Also, a volcano should have a clear positive magnetic anomaly, and we don’t see that at all." "This does not rule out the possibility that the two new Greenland craters were made in a single event, such as the impact of a well separated binary asteroid, but we cannot make a case for it either," said William Bottke, a planetary scientist with the Southwest Research Institute in Boulder, Colorado, and co-author of both MacGregor’s paper and the new lunar impact record study. "The existence of a third pair of unrelated craters is modestly surprising but we don’t consider it unlikely," MacGregor said. "On the whole, the evidence we’ve assembled indicates that this new structure is very likely an impact crater, but presently it looks unlikely to be a twin with Hiawatha." The restaurant has started to gather feedback from their customers through the survey process. You can participate in this survey easily by visiting the pandaexpress.com/feddback restaurant. After your purchase from the restaurant, you will be given a purchase receipt that contains the survey invitation on it. Customer Satisfaction is an Intermediate between company and customer. By the survey, the company asks their customers for their opinions on issues related to how well or how poorly the companies are performing.